To all the RNs, NPs and nursing students who work and study hard to keep people healthy and care for them when they are sick or dying, we thank you. Your phenomenal dedication to Ontarians and to nursing is valued. This year, RNAO organized several events to recognize nurses in their workplace as well as spread awareness about the positive impact RNs have on a wide variety of health outcomes. To kick off Nursing Week on May 8, RNAO CEO Doris Grinspun as well as RNAO President Carol Timmings and Nursing Research Associate Zainab Lulat released 70 years of RN effectiveness, a comprehensive database created by RNAO at a media conference at Queen’s Park. The database includes 626 research studies, which show RNs have a positive impact on a wide variety of health outcomes, including reduced mortality, increased quality of care, increased patient satisfaction and cost savings. Despite this evidence and the recommendations set out in RNAO’s Mind the Safety Gap report, Ontario has the lowest RN-to-population rate in Canada and RN replacement is commonplace. For more information, please read our media release. Throughout Nursing Week, Grinspun, along with other RNAO leaders, accompanied MPPs as they visited health facilities in the province for the 17th Take Your MPP To Work. Premier Kathleen Wynne, PC leader Patrick Brown and NDP Health Critic France Gélinas have already participated this year. If you would like to take your MPP to work, please contact Annie Ytterberg (1-800-268-7199 ext. 214) or email her at aytterberg@RNAO.ca. Health-care organizations across Ontario were also honoured for successfully incorporating the latest health research and evidence into their clinical practice and becoming Best Practice Spotlight Organizations. To mark the honour, organizations such as St. Peter’s Residence at Chedoke in Hamilton, and Trillium Health Partners in Mississauga held celebrations. To cap the week, RNAO held its annual Health Professional Expo where RNs, NPs and nursing students networked with potential employers and heard from nursing leaders. Toronto Star’s 2017 Nightingale Award was also presented to winner RN Peggy Dickie. Plaques were also presented to the three honourable mentions: NP Deborah Brown, RN Sandra Sargent, and RN Jasmina Topalovic. 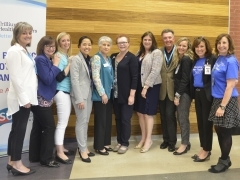 For more information about this year’s Nursing Week, please read the Toronto Star Nursing Week supplement and the Windsor Star article about Grinspun’s luncheon with nurses in Windsor.